I got a lovely wee package in the mail yesterday. 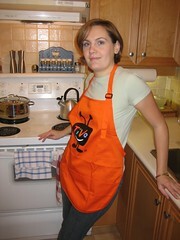 TiVo was sharing some love, in the form of an apron! WooHoo! They sent it because I was supposed to host a TiVo tasting party (they loaded my box with a bunch of content, with the intention of sharing it with my friends), which I never did get around to. But I sing the praises of the TiVo often enough, and pimp the TiVo love all over town, so I don’t feel guilty accepting the gift anyway. I’ve already given it an inaugural run, and covered it in spaghetti sauce splatters from tonight’s dinner. Neil also gave it a trial run while prepping salad. I’ve included that particular photo under the cut. Don’t say I didn’t warn you. Whooee! I’m impressed that photo made it past the school district censors! I have seen far too many pictures of semi-clothed Neil. Usually I’M the naked one, but he’s stealing my crown! Chris: I’m sure I’ll regret this, but then I suggest you kick it up a notch!